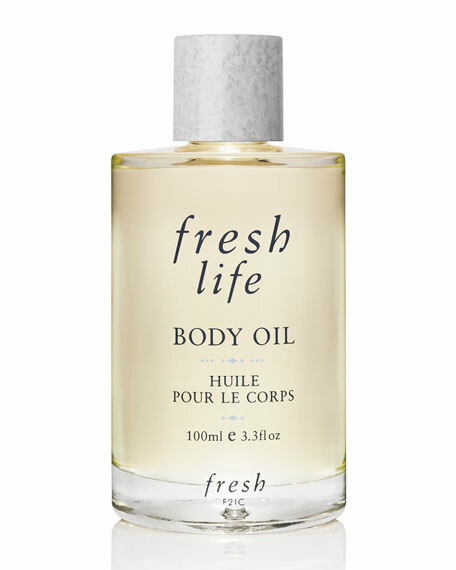 Fresh Life Body Oil captures the ultimate Fresh moment with a scent that conjures the freshness of a clear blue sky, sweet morning air, a sparkling sun, and velvety water. The luxurious blend of highly precious, skin-soothing oils and extracts is proven to provide 24-hour moisture and restores suppleness, while leaving the skin super soft and heavenly scented. Evening primrose oil helps renew the skin, while sweet almond and jojoba seed oils help restore moisture and suppleness. The formula is further enriched with apricot kernel and sunflower seed oils, rich with vitamin E to help soften and protect. White lily flower extract helps soothe.